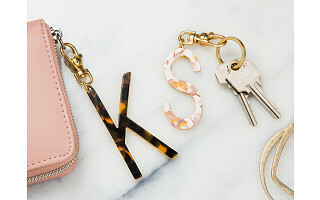 John Wind’s tortoise-style initial key chains are eye-catching examples of his personal style philosophy—classic with a twist. They blend modern and classic design elements in one attractive add-on. John created these pieces as a tribute to two glamorous (and influential) women: his mom, and Jackie O. The oversized tortoise sunglasses both ladies wore in the 1970s were the inspiration for the key chains that share a similar vibe. There is a vintage feel that’s made fresh with updated touches, like gold-plated metal backing, and a rose tortoise look that makes the traditional material feel even more contemporary. 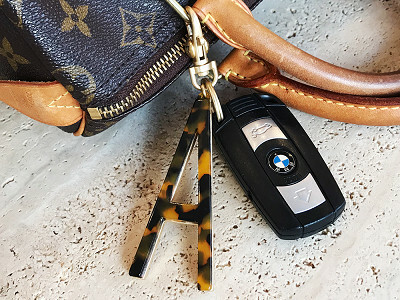 A sturdy swivel clasp lets you easily add an initial to a key ring or to a bag to complete any look. How large are John Wind keychains? The oversized keychain is 4.75" x 2" x 0.25". The rose keychain is 4.25" x 2" x 0.25". How should I care for my John Wind keychain? 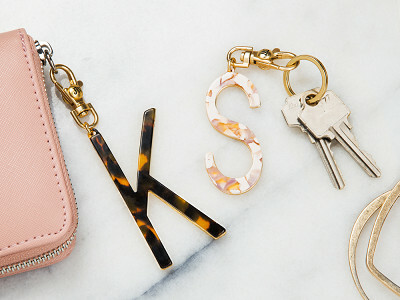 To care, keep the keychain dry and store it in a pouch or bag to keep dust away. Do not use jewelry cleaning chemicals on this product. 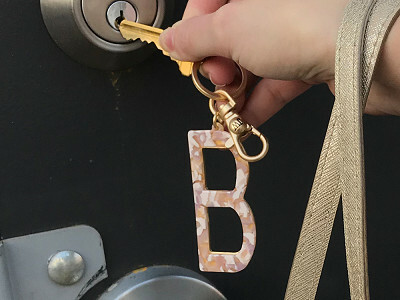 John Wind’s tortoise-style initial key chains are eye-catching examples of his personal style philosophy—classic with a twist. They blend modern and classic design elements in one attractive add-on.